When people talk about wildlife, they usually mean land animals. But more than 70% of our planet’s surface is ocean. Life first appeared in the ancient oceans around four billion years ago, and stayed there for a long time. Even now, some of Earth’s most biodiverse environments are underwater, and scientists estimate that less than 10% of all marine species have been discovered. Being underwater and seeing the life below the surface is incredible; it’s an entirely different world unlike anything on land, bathed in shifting light patterns, almost hauntingly beautiful. Few people know this better than Kyle McBurnie. I first came across Kyle’s photography while flipping through the Oceans category in the 20th anniversary edition of Nature’s Best Photography magazine. I’ve never been diving and I’ve only snorkeled a few times, but his photos instantly brought back that feeling of quiet awe that I’ve only experienced underwater (although the oceans aren’t actually very “quiet” these days – marine noise pollution from ships and mining is a huge issue for whales and dolphins). These days, Kyle does more filmmaking and videography than still photography. He explains that it can be hard to tell the full story of an animal’s life and behavior in a handful of images, and by shooting video, he can truly dive into the stories of the animals he films. His film footage is amazing, and he recently received a Young Explorer Grant from National Geographic to film underwater bioluminescence. Kyle’s father was fascinated with marine biology, but never pursued it as a career. He did, however, pass on that passion to his son, and supported him in getting scuba certified as a teenager and studying marine biology in college. 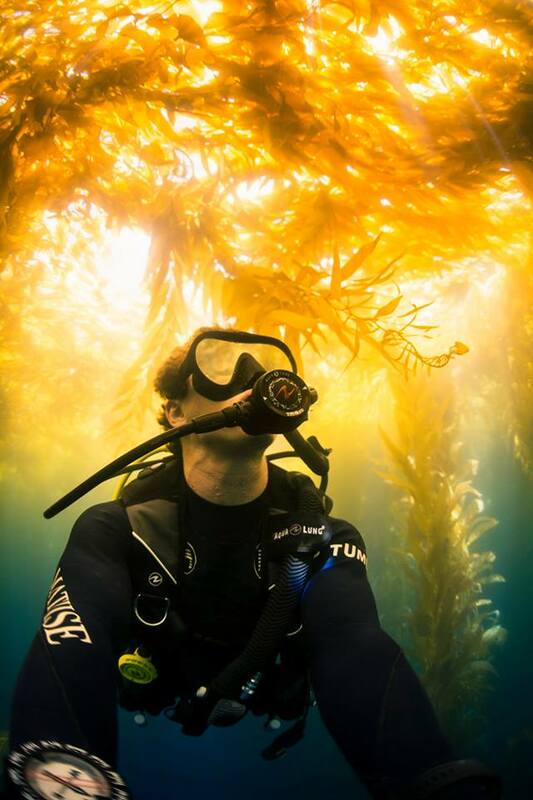 After working aboard a dive boat, Kyle and a friend started their own recreational dive company, where they take people out to meet sharks and other inhabitants of the California kelp forests. Kyle fondly recalls a particularly special day when a female blue shark spent an unusually long time with them, and they stayed in the water with her into the evening: “We watched the sun go down and blow up the sky. We were in the water, and you could see the shark – she was glowing red from the sunset.” Kyle describes blue sharks as “a good ambassador shark.” Sharks could use some good publicity; Jaws didn’t do them any favors. 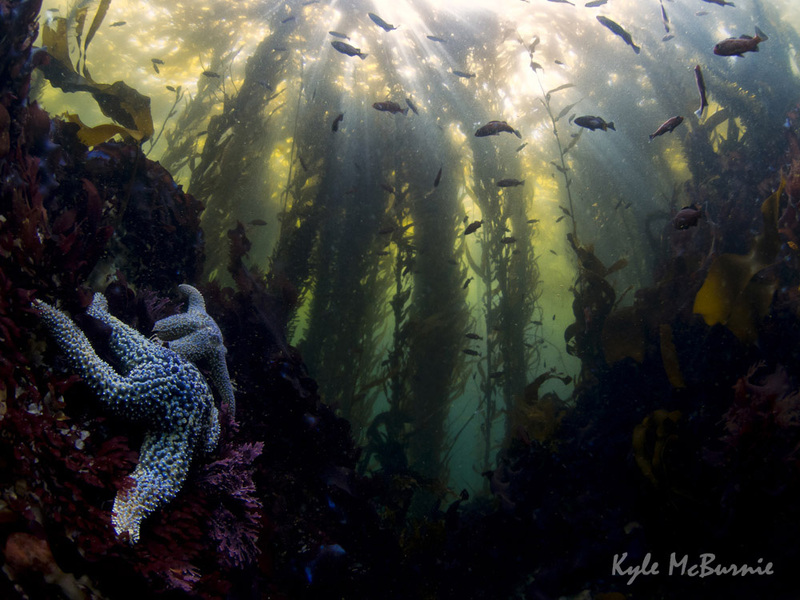 All in all, Kyle spends a lot of time in the water, and it’s affected his perspectives on marine biodiversity. When I ask him about this, he’s unsure at first: “It depends … sometimes when you’re photographing, you’re not paying as much attention to what’s going on in front of you because you’re trying to get the shot, so you might not have noticed that second species of fish swimming by in the background. But on the flip side, if you’re photographing for natural history, you’re paying a lot more attention to behaviors, and species, and who’s interacting and stuff, so… I’d say being a photographer makes me more aware and want to know more about what I’m seeing, versus if I were just diving somewhere and I’m happy to just take the divemaster’s word for it.” He’s also personally witnessed the effects of warming oceans on California kelp forests, and is very aware of issues like overfishing, pollution, and diseases. Kyle mentions that it would’ve been a lot easier to run a business based around animal interactions 20 years ago, when things like blue and mako sharks were more abundant. 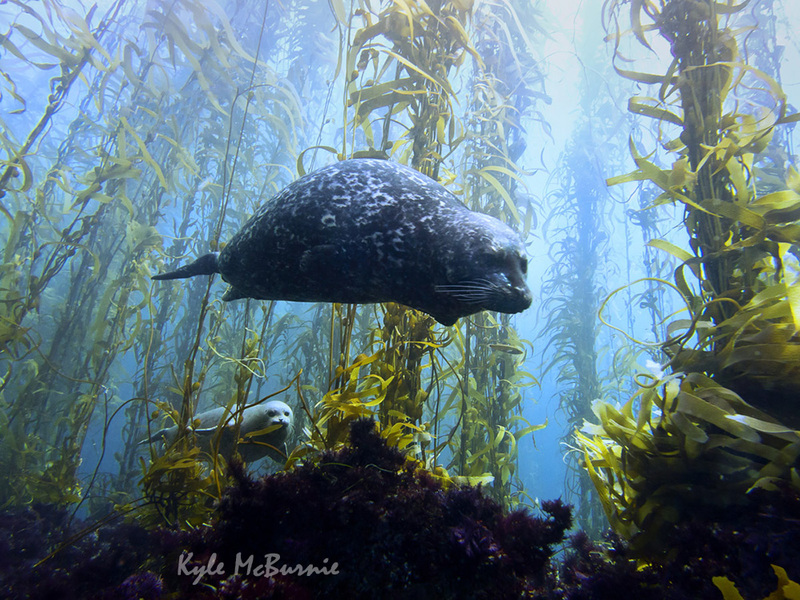 One thing that’s really important to Kyle is the establishment of marine protected areas, or MPAs, which are sort of the ocean equivalent of national parks. Fishing, diving, and other human activities are regulated to protect the local marine life. His favorite diving spot, San Clemente Island, is not protected, nor are a lot of other important and biodiverse areas off the California coast. Another major issue is that MPAs don’t always completely protect pelagic species, or those that live in the open sea. Many types of fish or other marine creatures might have different stages of their lives in different places with different fishing laws, and one place might have a strictly regulated MPA while another might have no protection at all. This is a huge, international problem, and Kyle strongly feels that we need pelagic MPAs and international species protection. What’s next for Kyle: Working on a VR experience film in the Philippines, looking for unknown plane wrecks in Papua New Guinea, and continuing to work towards protection of pelagic species. Once you're comfortable, focus on adapting your body language. Some animals are shy, so be submissive. Some animals are curious, so make yourself obvious. Play to the psyche of your subject. Talk to people in the area you might be diving to learn about what animals you can find where, and what they might be doing. Spend a lot of time in the water and be patient – you’ll be rewarded with amazing things.